Well, I actually see them as being one side of the same coin because they each come with the same side of fears. And I personally know this very well because I have been through it many times in my own life. 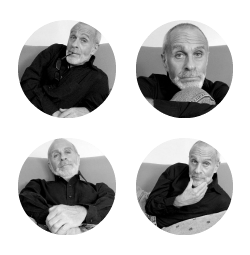 For instance when I was an actor, I longed for success but at the same time feared it because I knew that I would be compared by the critics and audiences to live up to my previous performance. And I think perhaps my worst critic and audience were the voices within my own head. And there were also times when I hesitated to audition for certain roles because I didn’t think I was good enough. It was much easier and safer for me to just not try. Because I always ended up feeling worse for not trying than trying. I’ve learned something about success and failure. It’s all in my own head. Success cannot be compared, nor will it ever be the end. And if I at least try, there is no such thing as failure. Have a flip-side of the coin weekend everyone! 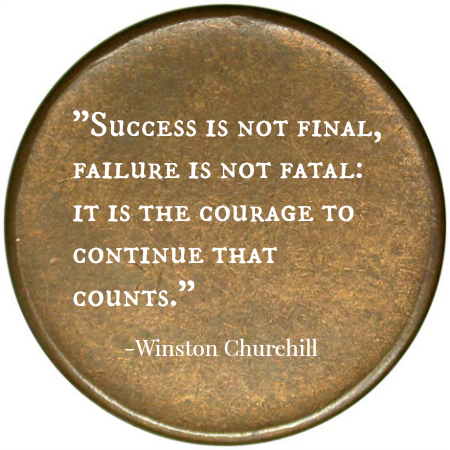 'It is the courage to continue that counts' ... Winston C got it right. I can't tell you the amount of lectures I've given myself for doubting what I do, have done, or have to do during the past year. Perseverance is now my 'A' word, 'cos I reckoned I wouldn't live with myself if I didn't at least try! I think I'll copy Winston's motto and stick it on the wall ... smiles. Such an inspiring post Ronnie! I love that you change the way I think with posts like this! I often feel that when I fail that is the end but as the last quote shows success and failure are not final we make it final but failing to push through. How true this is! I struggled with the same thing. We will never know if we don't try. Ron, I really enjoy the posts you share about things you've learned in your own life because it inspires me see things in a different way. "Success cannot be compared, nor will it ever be the end. And if I at least try, there is no such thing as failure." Sometimes I think I'm more afraid of success than failure because of what's expected of me once I succeed. And those thoughts, as you said, are really in my own head. Isn't that quote by Winston Churchill fabulous? One smart dude is right! "I can't tell you the amount of lectures I've given myself for doubting what I do, have done, or have to do during the past year. Perseverance is now my 'A' word, 'cos I reckoned I wouldn't live with myself if I didn't at least try!" Me too! And acting, above all the careers I have ever had has taught me that the most because it's probably been the one career where I felt the most vulnerable and self-doubt. Yet it taught me so much about life in general. "I think I'll copy Winston's motto and stick it on the wall ... smiles." Isn't that an AWESOME quote?
" I often feel that when I fail that is the end but as the last quote shows success and failure are not final we make it final but failing to push through." And if I at least try, there is no such thing as failure. Only successful lessons. Thanks a bunch for stopping by, my friend. Have a fantabulous weeekend! "I struggled with the same thing. We will never know if we don't try." "Sometimes I think I'm more afraid of success than failure because of what's expected of me once I succeed." Exactly. And I think the same thing too. Because success leaves us open to the possibility of failure to succeed again. Which in turn, takes away the pleasure of enjoying our success. Ron, I like your flip side of the coin take on this. I have never thought of fear and success as having similar fears and being the same side of the same coin but you nailed it. And the times I've not done something out of fear of failure I too have felt worse than not trying at all because I've always wondered what would have happened had I tried. It seems we sometimes sabotage our successes with thoughts of doubt before we even give it a go. Ron, I'm away on vacation this week but wanted to stop by and say what a great post this was. As always, I love the way you write and make me think. See you next week when I get back and have more time to comment. Winston Churchill was plenty smart, but so was Yoda. After all, he's the one who famously said, "Do. Or do not. There is no try." "I always ended up feeling worse for not trying than trying." Right on, Ron! That's a great attitude, and I agree with you completely. It's better to have loved and lost than never to have loved at all, right? This comment is just full of famous quotes.
" It seems we sometimes sabotage our successes with thoughts of doubt before we even give it a go." You said it, buddy. And how TRUE that is! It's often all in our own head, isn't it? Thanks a lot for stopping by, Matt. Have a most excellent weekend! Aw...thank you so much for stopping by while you're on vacation, buddy. Appreciate that! Hope you're having a faaaaaaaabulous time! See ya when you get back and have a safe journey! "Winston Churchill was plenty smart, but so was Yoda. After all, he's the one who famously said, "Do. Or do not. There is no try." OMG...that's right, Churchill did say that! And you're right, he was plenty smart but also very YODAish.
" It's better to have loved and lost than never to have loved at all, right?" Much thanks for stopping and sharing your inspirational quotes within this post! Have a grrrrrrreat weekend! Fear of failure/Fear of Success - I know there is supposed to some subtle difference but I'm not sure what it is...Fear of failure - you never try. Fear of success - you try but not harder enough? Love that quote by Churchill! I know just what you're talking about here, Ron. I think perhaps ALL creative, sensitive people experience self-doubts. It's a daily, ongoing challenge to force ourselves to "step outside that comfort zone" and do the things that make us SOAR! "Too often, we attribute our success to "luck" or "chance," maybe because we're too modest to just look in the mirror and say we're worth it because we worked it! 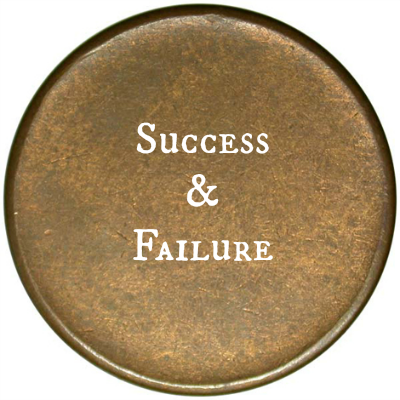 I know we can't always be "sunshine and flowers," but let's just TRY to look on the bright side and refuse to call ourselves "failures" (even if what we try doesn't always work out -- hey, it's called a "learning experience," then, right?!)" OMG....you are so right on about that! And you mentioned something that I wanted to add to this post but forgot, which was to take the time to CELEBRATE our successes. And not only our successes but our failures as well. Because as long as we tried, failures are never failures. Just a "learning experiences." Thanks so much for stopping by and adding your wisdom to this post topic. Happy weekend, dear lady! Ron, I need you as my own personal guru. Thank you for this inspirational post. Maybe I will ride even scarier rollercoasters next summer! Of course I agree - I really do believe in the idea of nothing ventured, nothing gained. And even when I "fail" I don't see it as failure. It's just a thing I tried that didn't work that way. I always hate when people refer to a "failed marriage." Is it? I don't consider mine a failure now that we've divorced. We had a good run of 20 years, have tow great kids, a business together and remain friends. In what way is that a failure? And when I try things that don't go as well as I'd like, I learn from it. so again, nnot failure. Life is just like that. "Ron, I need you as my own personal guru"
Yet, I don't see myself as a guru. I just tried to take the things that challenge me in my life and see them as lessons and things that I can learn from, and then I share them in the hopes that other people might receive something from them. "Maybe I will ride even scarier rollercoasters next summer!" You GO, girl! And I applaud you for going on the Flight of Fear because I would have been SO scared!!! Thanks so much for stopping by, my friend. Have a fantabuous weekend!
" And even when I "fail" I don't see it as failure. It's just a thing I tried that didn't work that way." Amen! As long as we try, there is no such thing as failure. And truly believe that.
" I always hate when people refer to a "failed marriage." Is it? I don't consider mine a failure now that we've divorced. We had a good run of 20 years, have tow great kids, a business together and remain friends. In what way is that a failure?" OMG...I can't thank you enough for saying that because I feel the exact same way whenever I here someone say they had a "failed marriage." Like you shared, in what way is that failure? I don't think that every marriage or relationship is meant to be forever, but that certainly doesn't mean it was failed. It only means that the time spent together as a couple has ended. I have always believed that the only real failure is to not attempt something, out of fear of failure. To attempt something, do your best and not accomplish the end result you wanted, is not failure. Thank you, Ron. You just reminded me why I should be writing, I've got to make sure that "regrets" is on the short list. I can't believe I'm going to edit Winston Churchill. But I would cut his wonderful words down to one short phrase: To have the courage to fail. Babs, you stated exactly how I feel about failure. "To attempt something, do your best and not accomplish the end result you wanted, is not failure." Amen. As long as we try, there is no such thing as failure. Much thanks for stopping by, my friend. Hope you've having a lovely weekend! "But I would cut his wonderful words down to one short phrase: To have the courage to fail." And you're absolutely right because what Churchill said it exactly what you said; only with less words. So, brava! Thank for stopping by, my friend. Enjoy the rest of your weekend! Fear is such an insidious squelcher of the soul. I, too, have been on both sides of that damn coin. I firmly believe that it's not always the best, most talented or brightest who succeed. It's the ones who just never gave up. Go Winston!
" I firmly believe that it's not always the best, most talented or brightest who succeed. It's the ones who just never gave up." You GO, Jayne! And I agree! Much thanks for stopping by, my friend! Enjoy the rest of your weekend! awful, humiliating feelings. Have been in the valley plenty of times. But as Winston said so poignantly, and even Frank, "I pick myself up and get back in the race. That's life." However, it does take a while with some experience to discover this, doesn't it? Enough falls to learn the bruises heal. And thanks so much for stopping by and catching up on my posts. You're a sweetheart! "I never thought of that saying being the same side of the coin. I imagine being an actor drives home that point very hard." Yes, it does, because being an actor seems to magnified the similar fears between success and failure because it can be such an unsure business. One day you're up, then next day you could be down. "Churchill's quote is a great one to remember when we're faced with the fear of failure." "Success cannot be compared, nor will it ever be the end. And if I at least try, there is no such thing as failure." ~ I definitely agree! Of course, those voices in my head... oh, but we all have them. Mine seem to scream at me some days. On other days though, when I'm quiet and not playing that game, I know all's okay. When I get up and am thankful for the day, another chance to learn and grow and love, it's a good day. "When I get up and am thankful for the day, another chance to learn and grow and love, it's a good day." LOVED that! And you are so right. Attitude and gratitude are so important! The fear of rejection and failure stop many from following their dreams, such a shame. How true that is, Pearl! If we at least don't try, we'll never know.